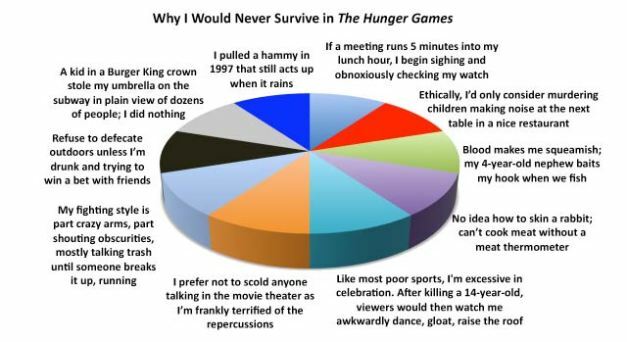 After yesterday's review of The Hunger Games, this pie chart seems particularly relevant. Awesome. Especially the scolding in movie theaters. What if they yell at you? Ha I know. I think I'm right along the lines of "blood makes me squeamish; my 4-year-old nephew baits my hood when we fish". LOL these are too funny! Yeah, me? no idea how to skin a rabbit either. Me? I'm the one sighing and checking their watch if a meeting runs into lunch hour. Great image. I'm totally putting it on my blog. I saw how to skin a rabbit on Survivorman. I might be able to do it... Though it would be gross. Excellent. This one is worth a pin.